Wilton's Michael Burns and Darien's CJ Raia in action as Wilton High School hosts Darien in a boys lacrosse game in Wilton, Conn., April 12, 2012. WILTON -- In a clash between perhaps the two best teams in the FCIAC -- if not the state -- it was Darien which exited Wilton High School's Fujitani Field with a 10-8 victory after a game-long seesaw battle. It was the first meeting between the two powerhouses since Wilton eliminated Darien in the semifinals of last year's Class M state tournament en route to the title. With the game tied 8-8 and 3:26 remaining in the fourth quarter, Darien's Case Matheis, who one game earlier became Darien's all-time point leader, whipped a shot past Wilton goalie Conor Johnson to put his team ahead for the last time. "Wilton played a great game and they never gave up, even when we were up 5-2. It was a fun game to play, and it definitely had that playoff atmosphere," Matheis said. "Me and Tim Murphy were behind the net, and I knew that I had had some success with my stutter step move on Robby (Keers). I got by him, took the jump shot and put it top corner." The Darien defense kept Wilton from scoring on what turned out to be the Warriors' final possession of the game. With one minute left, Darien regained possession, got the ball behind the Wilton net and began to work on the clock. With 27 seconds remaining Matheis got a wide open shot and scored his fourth and final goal of the evening. "It probably wasn't the smartest idea to take that shot," Matheis said. "Coach wasn't happy about it, but it was just kind of an instinctual kind of play when you see the wide open shot." Darien actually held an 8-6 advantage heading into the fourth quarter, but it was Wilton which came out firing in the final stanza. 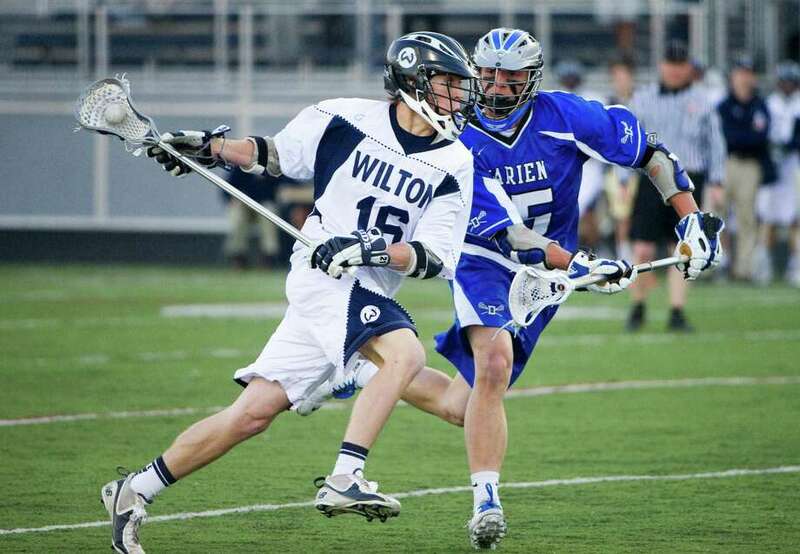 After just 42 seconds, Wilton's Sean Carroll beat Darien goalie Paul Huffard to pull his team to within one. With 4:39 left, Wilton drew even for the first time since the first quarter on a wraparound goal by Cole Rance, knottingthe game at 8-8 to set the stage for Mathies' heroics. Despite the loss, Wilton coach John Wiseman was in good spirits after the game. "Someone's got to win and someone's got to lose. I'm impressed with the kids. We fought back and we made some mistakes," Wiseman said. "I'll put that one on me because we tried to get a little too tricky instead of just playing our game. When we play Wilton ball we don't have to do anything tricky." The Warriors took their first and only lead of the game when Carroll opened the scoring after taking in a pass from Bo Winsor in the first quarter. Darien took a 3-1 lead by quarter's end on goals by Matheis, Bobby Weaver and a second by Matheis. Wilton's Michael Slaughter cut Darien's lead to 3-2 early in the second, but Darien's Henry West and Jon Magnusson both found the back of the net to give the Blue Wave a 5-2 halftime advantage, the biggest lead for either team on the night. "We just told them to keep playing. There's no doubt that these are two good teams and they all know it," Wiseman said. "Their goalie played great in the first half. It was a great lacrosse game." The goals came fast and furious in the third quarter and Wilton quickly cut Darien's lead to 5-4 on a pair of goals by Chris Nugent. After that, the team's traded scores until the end of the period on goals by Darien's Kevin Seiler, Nugent, Darien's John Reed, Wilton's Matt Kobyra and West. Both goalies made their fair share of difficult saves as Huffard stopped 11 shots and Johnson stopped seven. "When we had the ball we did some good things. It's triggered by Case, but we've got a lot of good players out there," Darien coach Jeff Brameier said. "It was a good battle. Our goalie played a great game for his first test under the fire and being a sophomore." Scoring: D--Case Matheis 4g, 2a; Kevin Seiler 2g, 1a; Henry West 2g; Bobby Weaver 1g, 1a; Jon Magnusson 1g; Tim Murphy 2a; W--Chris Nugent 3g; Sean Carroll 2g; Matt Kobyra 1g; Cole Rance 1g, 1a; Sam Slaughter 1g, 2a; Connor Devance 1a. Goalies: D--Paul Huffard (18 saves); W--Connor Johnosn (7 saves).